Contrast CTRL has grown over the years into something amazing! Yet again we are at a place and time for change. With the new slogan “Music That Matters”, we will be turning future interviews into this segment of articles for your enjoyment. First up is Bianca Muniz, a 22 year old Jazz singer who exhibits a bright personality and voice that is very dynamic. Her music is more fitting to the Neo-Jazz subgenre as it touches on many styles of music to create a interesting experience of fast paced songs to slow songs and something wonderful in between. Bianca kindly took time before her most recent band practice to tell me about herself and the music she creates. Without further ado, let’s get right into the interview. How did Bianca’s musical journey start? “Honestly it all started when I was a little girl. My mom was a singer and she sang all around the house. When I was a little girl and everyone around me would start singing, I’d tell them to stop so I could be the only one singing. From an early age children are often forge from the product of their environment and it in many cases helps to create the musical foundation for artists such as Bianca for years to come. So out of all the styles of music she has heard in her lifetime, what made Jazz so special? : “That is a great question! [Bianca laughs] I guess Jazz really got in my ear when I was younger. I didn’t realize this but Jazz was always in my house playing, when my mom would drive around I would hear Disco, When my dad would drive around I would hear classical and pop and funk music. 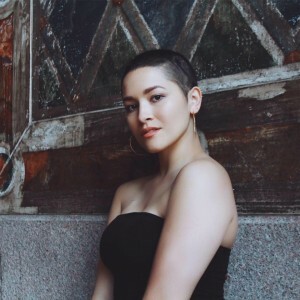 Comment from CC: In such a unique genre as Jazz, Bianca Muniz‘ approach and style on Scary Dreams is quite refreshing as the more abstract parts of her music are smoothly transitioned with the traditional instrument section that provides a very nice palette to the Bianca Muniz Experience! What does Scary Dreams mean to you? : “My band members like to joke around and make stories about it. Scary Dreams is just me accepting myself and my writing. It took me a long time to be at the point of being proud of myself. Being comfortable with who we are in a world that is always demanding more of us can be tough, so finding a message that tells us we can be happy with how we look or who we try to be is always a message we want to find. A fun fact about Bianca is she sings alongside her sister Jacqueline. During the interview she expresses great admiration for working alongside her sister and bouncing harmonies off one another to really make the music shine. Changing up pace and giving you the spotlight, who would you want to collab with or tour with? : “Right now I would have to say, I would love to go on tour with Little Dragons, I absolutely love their music they are one of my favorite sources of inspiration. I would love to tour or collaborate with Becca Stevens, she is one of my mentors and her music is so beautiful. That takes me to whole other place. Giving you a special spot on this article, what would you like to say to the readers of Contrast CTRL? : “Thank you for reading this and reading about me and possibly listening to my music, So thank you for that. Thank you for your support I wouldn’t be able to do this without you. Audience is the biggest foundations of music and so I thank you for that. I think all musicians appreciate the support in general. With that warm message conveyed, Bianca Muniz is working hard to release a new song and prepare her band for future tour dates. I’d like to extend many thanks to Bianca for speaking with me and allowing Contrast CTRL to feature her. Scary Dreams by Bianca Muniz is a 4 track EP that features Abstract tones and traditional Jazz rhythms and instrument sections that will resonate in your mind for days. Be sure to give this album a listen and as always, find music that matters to you. Bianca Muniz, Contrast CTRL, Control, EP, Featured, Interview, Jazz, Music, Music That Matters, Scary Dreams. Bookmark.